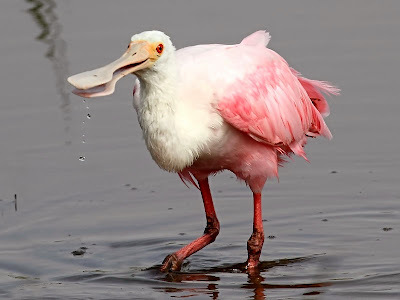 The roseate spoonbill is one of six species of spoonbills found around the world. They are all a part of the Threskkiornithidae family which also includes ibises. According to DNA studies the roseate spoonbill, which is the only spoonbill in the Americas is most closely related to the yellow-billed spoonbill that is found in southeast Australia. It is believed that these two species evolved from a common offshoot of the ancestors of the other four species. 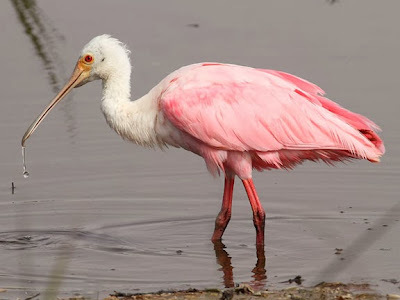 The roseate spoonbill is found primarily in tropical regions of South America and the Caribbean. There are also small numbers of this species that breed in North America. The North America birds breed along the Gulf Coast in southern Texas, Florida, and Louisiana. They seem to prefer fresh water habitats but are also found in coastal saltwater areas. 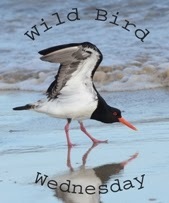 They swing their odd shaped beak from side to side to sift through the water and silt on the bottom and forage for crustaceans, aquatic insects, frogs, and small fish. Their food provides the carotenoid pigments which give the birds their pinkish coloration. I'm hoping to spot this one here in the US. They are such beautiful birds. Every once and awhile, one comes through Arizona. Although, I think we have to wait now until summer. Beautiful bird! What pretty bird, love his color! Hi. This is a beautiful bird. beautiful! it's interesting that the eye is so red too. Our yellow-billed has white eyes. I love the two views of the beak. The first photo makes it look quite a character. Great looking bird with an interesting background. This bird is on my life list, of course I will have to go find it. None up here in my part of the world. Great shots! A stunning species beautifully captured in this post. I was lucky enough to see them in Venezuela. Great post. What an interesting looking beak! And I love its colours! hi. What a beautiful bird on this post. great shots. What a pretty bird, love his color.